The true story of a young woman from Münster in Germany, who follows her heart and moves to Namibia, was shown on German television channel ZDF on Pentecost Monday. The film ‘Emigrating to paradise: a new love’, follows her everyday life in Windhoek, a safari through Namibia, her wedding in Swakopmund and it also features Namib Desert Lodge: the love-struck couple has a champagne sundowner on top of a Namib dune and drink a toast to their future. The 45-minute programme ‘Auswandern ins Paradies: Eine neue Liebe’ (Emigrating to paradise: a new love) is aired by German television channel ZDF on Monday, 28 May, at 13h40. Apart from Lisa and Jochen in Namibia it also features a couple in Bolivia. Viewers are welcome to address their comments to zuschauerredaktion@zdf.de. Long before the Twyfelfontein engravings became a popular tourist destination and received recognition as a world heritage site, the land was visited sporadically by Damara people watering their animals at the trickling spring (or ‘fontein’ as it’s called in Afrikaans). 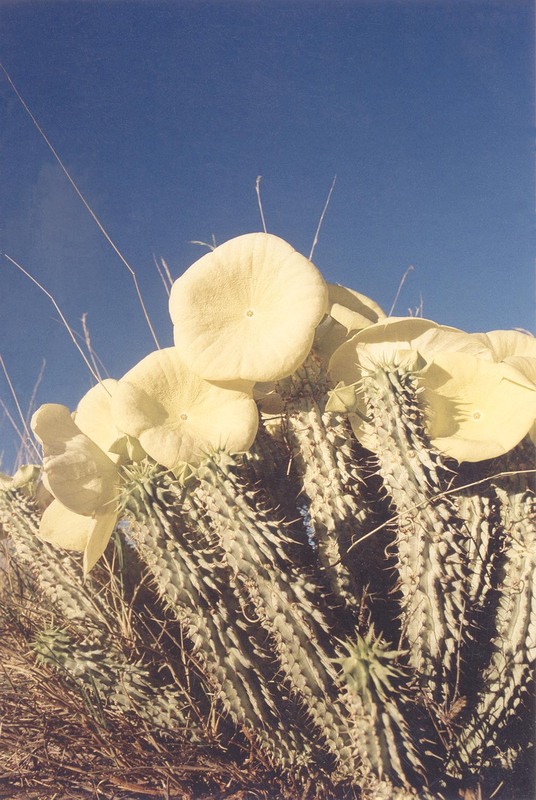 It was named Twyfelfontein (‘doubtful spring’) by the farmer, David Levin, who settled on the arid land in the late 1940s with the hope that the spring’s water could sustain them. When he first enquired about the piece of land in north-western Namibia, south of the Aba-Huab River, he was told that no farmer could survive there, it was desert. The Land Board clerk explained that it was his duty to ensure that people did not settle at places where they couldn’t make a living. 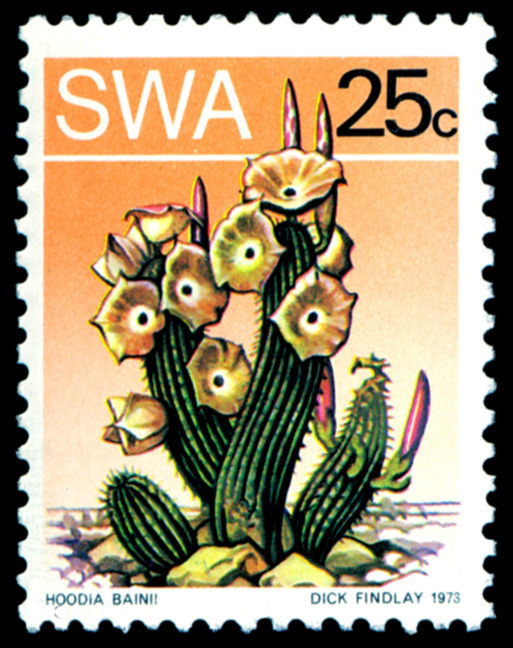 David argued that although the piece of land with the spring was small, the entire Namib Desert around it lay uninhabited. Its Damara name was Uiais (spring) and it draw him like a moth to a flame. The year was 1946 and David was passing through Windhoek with his pregnant wife Ella, his two children and his father-in-law, Dirk de Beer. They had travelled from Nuichas in southern Namibia and were en-route to Dirk’s new home in Dobbelsberg. The Levins joined the trek north with their animals, hoping to make their home in the Kaokoveld. The South West Administration had been issuing grass licenses in the Kaokoveld since 1942 but David didn’t have the means to apply at the time, and by the time he did, there were only remnants left that could not be allocated until the land was surveyed. He was upset but ensured that before they departed he received permission to visit the spring to ascertain if there was the possibility of farming there. It was two months before David and Dirk managed to extricate themselves from the demands of Dobbelsberg and travel the 300 km. They investigated the small spring that seemed to be blocked by rock, debated its source and the possibilities of increasing its flow, and camped out in the mopane bush, listening to the sounds of the Kaokoveld – the jackals and the barking geckoes. On their return they visited the farms along the route, organising watering points and overnight stops for the long trek out. At the beginning of 1947, the Levin family made the journey north-west. They waited at the farm Blaauwpoort while David and his worker went ahead to the spring to prepare for the arrival of the animals. They dug under rocks to increase its flow and excavated a furrow to clay hollows for watering the animals. The family then made their way with their meagre possessions to their new home of bleached grass edged by huge red table-top mountains. They had 230 sheep and goats, six chickens, two horses, four donkeys, a horse cart, a donkey wagon, a square tent and some household items. The battle for water began. It took careful planning to ensure that animals and humans would survive. Each animal could only drink every second day, grazing in between. The watering process consumed everyone’s lives. When neighbours visited, Ella would inform them that David was at the spring and every time Andries Blaauw from Blaauwpoort arrived, he would find David on his knees digging. When Andries asked after David’s health, he would inevitably receive the reply that he was well but that he doubted the spring would make it to October when the first rains would arrive. Andries soon referred to him as David Twyfelfontein, David ‘Doubtful Spring’. By the time David had to register a name for the land (he had finally convinced the Land Board to grant him a grass license), the name had stuck. For the first few years, all household water had to be carried from the spring, and later from the well to the house, until David was able to connect metal piping. When the family arrived at Twyfelfontein, goods were in short supply after the war and the road to the nearest town of Omaruru was impassable in a horse cart. At difficult times the family learnt how to dig up ant nests and harvest their grass seed stocks. Ella made her own soap from animal fat, baked bread in a clay oven and cooked on an open fire. She continually suffered from health problems. The Levins main source of income was from karakul pelts sold to farmers’ co-operatives that would later sell them at auctions. Goats were occasionally sold and animal bones and skins were often directly exchanged for flour, sugar, maizemeal and household necessities. When David bought a truck at the end of 1947 and struck water on the farm in 1948, he was slowly able to increase his flock. The stifling tent was replaced by a reed hut and eventually a house as he made clay bricks and extended the house, room by room. The farm was surveyed in 1952, and in the same year Ella gave birth to twins. The late 1950s brought years of drought and the family had to take to the road trekking to surrounding areas to graze the animals, moving on when the land was depleted. The Levins’ days at Twyfelfontein came to an end in the 1960s. Ella passed away in 1962 at the tender age of 42. The Odendaal Commission investigated creating a homeland for the Damara people in the Kaokoveld and David and the farmers in the area were required to sell their land. He objected initially but finally relented when it seemed that the fates had conspired against him. He moved to Outjo in 1965 and later on to Piketberg in South Africa. Throughout the rest of his days, however, he yearned for his country, his people and his farm south of the Aba-Huab River – Twyfelfontein. How does one know that the Namib is the oldest desert on earth? And that the ostrich originates in Namibia? The answer to both questions is the same and it is revealed by the fossilised dunes of the Namib, or rather, UNDERNEATH the Namib Desert. Largely covered by the sand sea of the ‘young’ Namib, the ancient sandstone layers become visible only here and there. One of the most beautiful sites – apart from the Tsondab Canyon close to Solitaire, which is closed to the public – is found in Gondwana Namib Park, some 30 km south of Solitaire. There the russet sandstone, known as Tsondab sandstone, has been exposed and cut into by an ancient river. Guests of Namib Desert Lodge spend the night right at the foot of the fossilised dunes or at the camping site with views of the dunes-turned-into-stone. These former dunes were already there about 20 million years ago. The sand compacted into sandstone during more humid phases 16 to 8 million years ago. 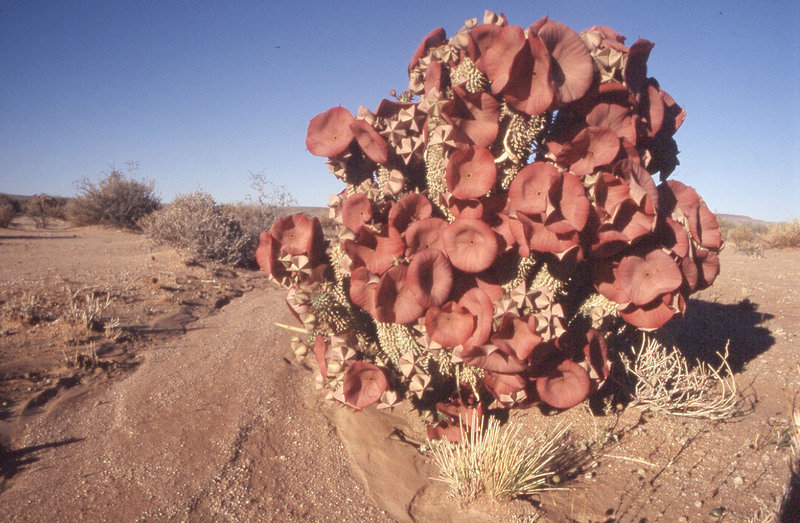 But desert conditions prevailed in many parts of today’s Namib even during ‘humid’ periods. That is the reason why experts regard the Namib as the oldest desert on earth. The stretch of sand sea which is 80 km wide and now extends from Walvis Bay to Lüderitz was formed much later. The sand, by the way, is erosional debris from the Drakensberg Mountains. It was washed into the Atlantic Ocean by the Gariep/Orange River and deposited on the sea floor and along the western coastline. Constant south-westerly winds carried the sand into the interior and over millions of years swept it into huge fields of sand and dunes. The fossilised dunes answer the question about the origin of the ostrich only when you take the time to stroll about and scrutinize the ground. You will find that here the Tsondab sandstone is extremely rich in plant and animal fossils. Roots have left their traces, for example, and tunnels of ants, termites, beetles and spiders are discernible. Even spider webs have been preserved – a rarity! A word of warning: collecting of fossils is strictly prohibited. Furthermore, the fossil remains of rodents and reptiles were found, as well as those of animals which remotely resemble aardvark (anteater), giraffe or elephant. Based on these finds scientists were able to piece together a rather comprehensive picture of the landscape of that time – it did not look much different from today. The most intriguing fossils contained in Tsondab Sandstone are fragments of large eggshells. They look similar to ostrich eggs, as we know them, and there are several variations which differ in thickness and in the pore structure on the outside. This suggests that there were different types of ostrich-like birds. Since similar shells are always present in other layers of similar age as well, the different types cannot have existed alongside one another at the same time. Instead, a sequence of different species becomes apparent. The oldest shells are from eggs which were laid about 16 million years ago. Their initial thickness of 4 mm decreased over the ages; today’s shells are 2.5 to 3 mm. The primeval eggs were also much larger – they weighed over 2 kg and had a volume of up to 1.7 litres. The equivalent today is about 1.5 kg and 1 litre. In Gondwana Namib Park some fossil shells have been discovered which do not seem to resemble any of the types known so far. They now have to be examined by experts. The layers of Tsondab Sandstone thus contain the phylogenetic tree of today’s Ostrich. On the basis of the eggshells its line can be traced back to an early ancestor that existed 16 million years ago. It may have resembled a giant bird which occurred on the island of Madagascar at that time. Therefore it is plausible that the Ostrich originates in Africa and spread to Eurasia only at a later stage. The fascinating story about the origin of the ostrich can be learnt from the book ‘Passage through Time – The Fossils of Namibia’, written by geologist Gabi Schneider and beautifully illustrated with drawings by artist Christine Marais. 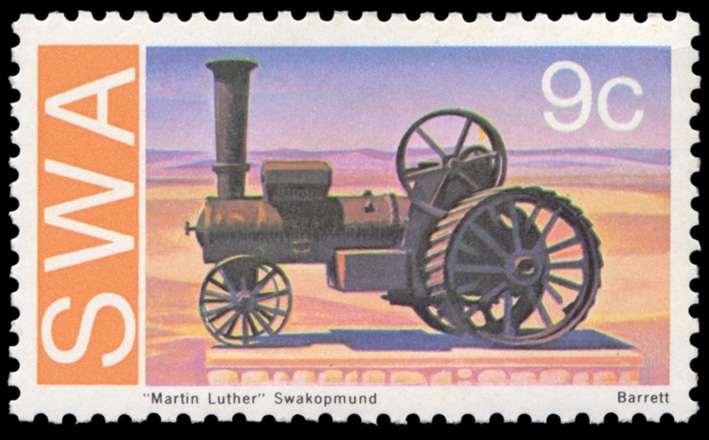 When you pass ‘Martin Luther’ just outside Swakopmund and have heard the story of the road locomotive you will probably chuckle spontaneously. But is the story that is told about the monstrous steam engine in fact correct? Was the whole idea really that crazy? But back to the start. As more and more settlers arrived in the country at the end of the 19th century, the volume of goods increased as well. Ox wagons were the only mode of transportation for heavy loads. However, almost 100 km of desert had to be negotiated on the way from the coast into the interior. There was nothing to feed on for the oxen and they were worn out completely. Many oxen died and the route was lined by their skeletons. The surviving animals needed months to recover from the ordeal. Therefore only three return trips per year could be made from the coast to Windhoek. It was still very early days for automobiles and plans for a railway line remained shelved because of the costs. In this situation senior lieutenant Edmund Troost had the idea to import a traction engine. His steam ox, as he jokingly called it, was supposed to drive from Swakopmund via Nonidas and Goanikontes to meet the ox wagons at Heigamgab and save them half the trip through the desert. “The route up to almost 2 km out of Swakopmund was (…) hard, of a rocky nature”, Troost stated. He also felt that enough water for the steam engine was available along the route. At his own expense he shipped the vehicle from Germany after obtaining the government’s assurance that public goods would be transported with his vehicle. However, even the vehicle’s arrival in 1896 started with a glitch: It could only be off-loaded in Walvis Bay and the departure to Swakopmund was delayed by business in Cape Town and unrest among the country’s Nama and Herero population until the contract with the engine driver had expired. As Troost reported later on, the nickname ‘Martin Luther’ had already been coined at that stage. First an American gold hunter, and after him a Boer, tried to drive the vehicle. The deep sand became a gruelling obstacle: The behemoth got stuck every 50 metres and shovelling it clear was a tedious process. Labourers simply stayed away, water had to be obtained up to 30 km away. Three months passed before the steam ox finally huffed into Swakopmund. But there was no end to the problems. The engine had to be stoked for three hours before the vehicle was able to move. Troost lamented that at times it was operated for only three hours per day because the engine driver insisted on his breakfast and lunch break. In retrospect he also said that the 2-metre tow bar to the wagons proved too short, causing them to swing off heavily to the sides on the uneven surface. A 10-metre tow bar would also have been an advantage when crossing sandy riverbeds because at least the vehicle and the wagons would not have gotten stuck together.